If you have been under the impression that you do not like fennel, dear neighbor, you may be mistaken : have you ever tried it raw ? Less fibrous than celery, it goes very well with other vegetables in salads. 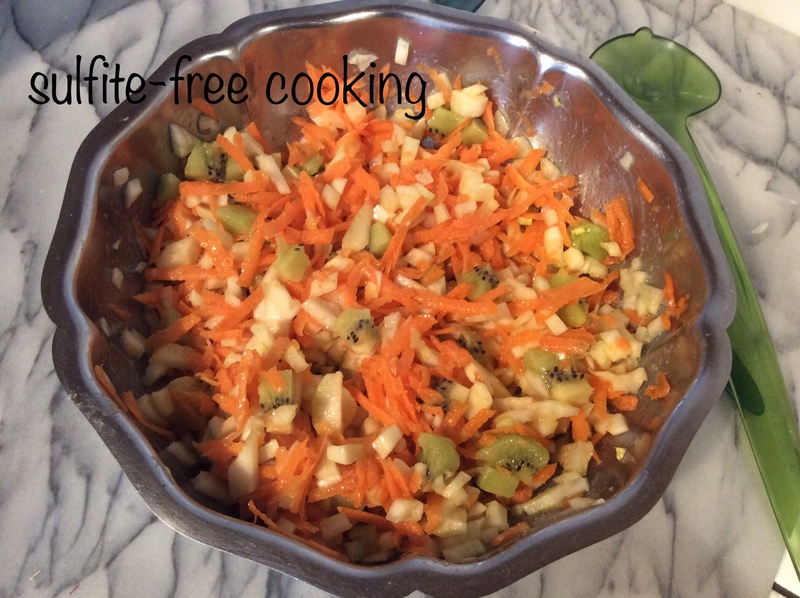 Here I paired it with carrot and kiwi fruit in a mild white miso dressing. Fresh food such as this always makes me wish for spring to come fast… Last week, in between rainy and cold weather spells, we had one single really beautiful sunny day, so we rushed to tend to our yard. My husband mowed the lawn and dug up the garden for this year’s pea patch, and I started cleaning up the flowerbed in front of our house. I am fighting a particularly tenacious type of weed, against which I have a personal grievance : it is the reason I ended up in the emergency room last year ! Being outside is wonderful for everyone — except maybe for the many worms whose tranquility I rudely disrupted… Sorry, little guys ! 1. Start by making the dressing : mix together miso and vinegar before adding the oil. No salt is necessary : the miso paste already has some. Also to be noted : it naturally contains some sugar, from the fermentation process of the rice, just as in « amazake », the traditional Japanese hot beverage enjoyed around New Year’s at shinto shrines. NOTE : if you don’t have any miso paste, simply mix the oil and vinegar with a little salt. 2. Remove fennel tops and cut bulb into quarters, so as to inspect it : sometimes dirt likes to lodge inside its base. Chop into small chunks – less intimidating ! 3. Peel kiwi fruit and cut into small cubes. 5. Combine everything and serve without delay to avoid oxidation and vitamin loss ! I hope you have enjoyed this post (which by the way for some reason my brain had the hardest time putting into English today!). So long, dear neighbor. My next recipe will be a « hiking special », in the hope that we’ll all have good weather to enjoy the great outdoors !